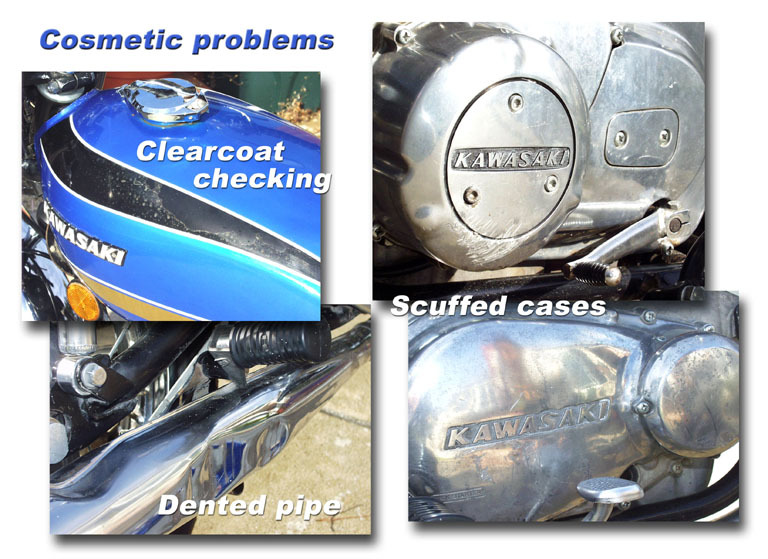 This is the story about the restore of the 1975 KZ400S that Stacey found on Ebay in August 2004, and bought for the price of $ 0,99. This diary will be continuous updated as the project moves on. 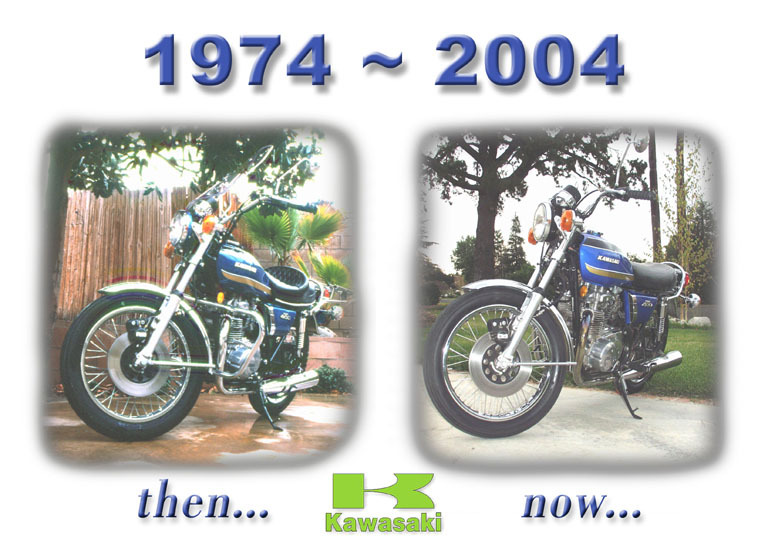 Stacey lives in California, and was once the owner of the 1974 KZ400 that was tested by the magazine Cycle World in 1974.
" The 1974 KZ400 that CYCLE WORLD used in their test was my bike. It was my first motorcycle. A friend helped my father find it for me. That friend was a man named Jack Murphy. He was a very important guy with Kawasaki at that time. He did most of their testing, much design and "special" projects. 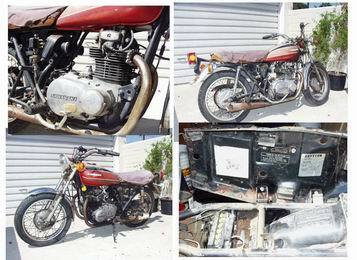 Anyway, I suddenly got the desire have a 1974 KZ400 again. And as luck would have, I just bought one today on EBAY for $0.99..... YES 99 cents! It needs lots of work, but I will have some fun putting it back together. " 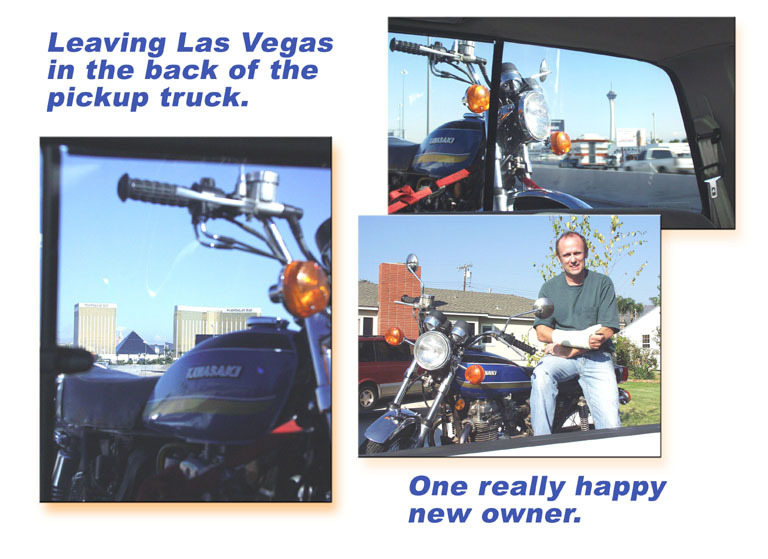 The pictures below is the first pictures he took after he collected the bike. And from now on I will let Stacey tell his own story about the project. I am very thankful for his contribution to this website. 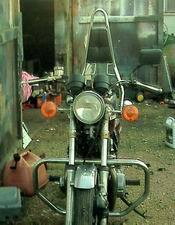 Here is the KZ400 that I bought on EBAY for .99 cents..... As you can see, it looks pretty bad. There is more damage than I thought. The right engine case has a glue "patch" where the brake pedal punctured the case. The fork crown is broken on both sides. But, the engine "turns" with the kick starter. I'll start to look for parts - but it will be a very long list of parts. Since getting the bike I have ordered some parts, TACH/SPEEDO/KEY cluster, NOS Front fender & rear fender. When I get the "cluster" I can then be able to check the entire electrical system. If it seems like there is some hope and life left in the ole-girl, I will then strip everything down to the frame for a lot of cleaning and detail work. 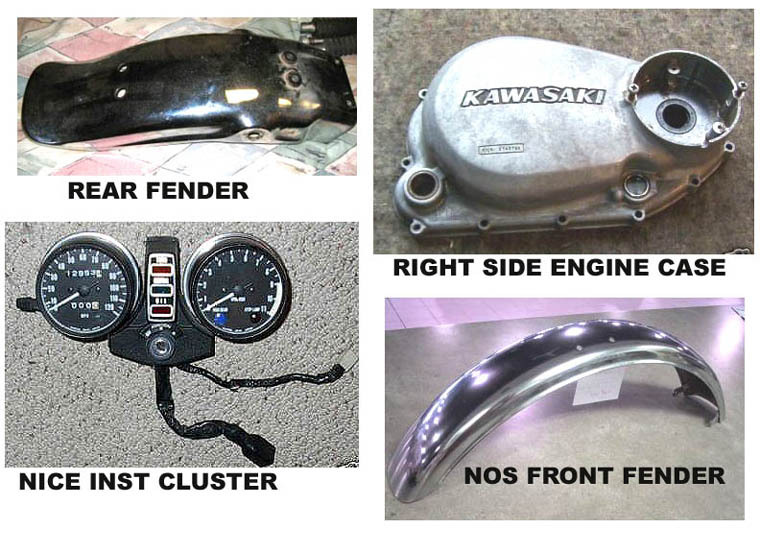 I have aquired many parts for my 75 KZ400. I am very excited about being able to get some actual NOS parts as well. 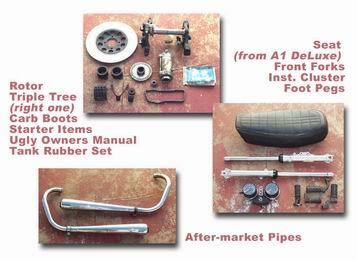 Ian Powell in England has some parts and will send pictures this week. I have also made several contacts with others for several more items. Exhaust pipes unfortunately are hard to find. I have found a set, but they are not for the earlier KZ400. 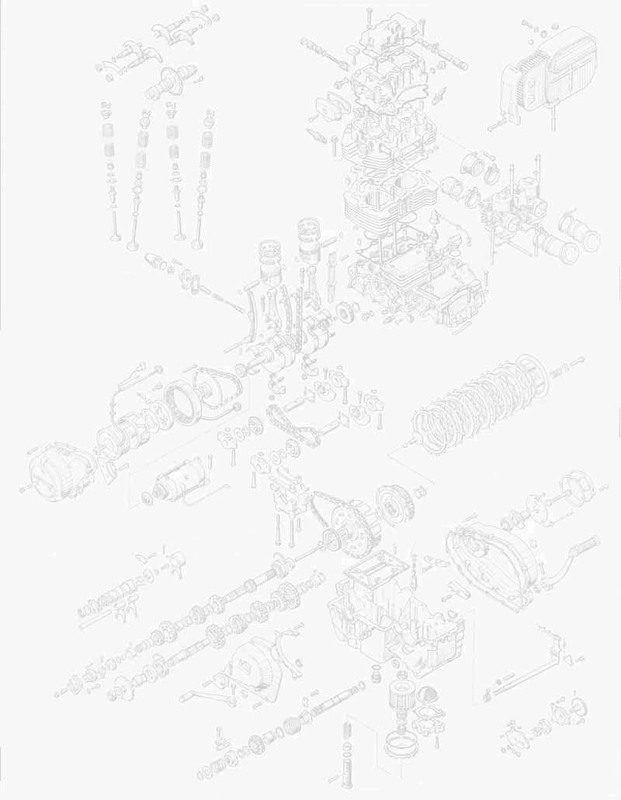 According to the pictures on the website, the pipes I found belong to 1978 ? They are "cone" shaped... I like the OLDER look with the seam on the top. Well I put a battery on the bike, and evrything lit-up. GREAT... Today I got the replacement Right Hand Engine Case I got off EBAY. It does not fit. One lousy screw hole is in a different location. I just assumed that a 1978 would fit my 1975... I WAS WRONG. I do not have a parts manual, and looking at the case is IMPOSSIBLE to tell. I have found the parts catalouge on ww.buykawasaki.com, and hopefullly it will help me avoid mistakes like this in the future. Ian have sent some beautiful photos of parts. 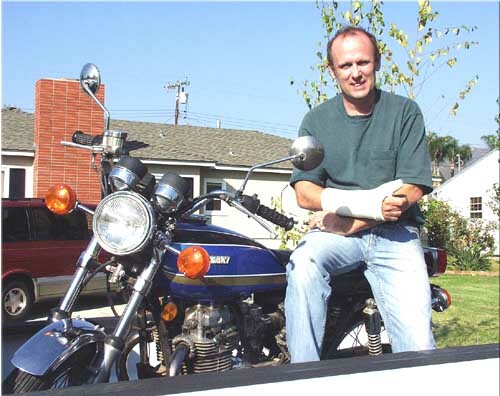 Well, my bike restoration has been slowed up a bit, as I now have a broken right thumb. My right hand, thumb and arm are in a cast... Oh well. I am however still on the lookout for parts. 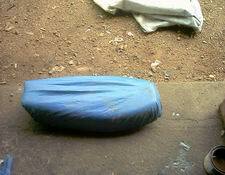 I have recently gotten a very clean INNER REAR FENDER and NOS LEFT ENGINE COVER. Wow, Christmas in October. I have continued to get more parts for the KZ400, and yet one more box is coming. Most of the items came from sellers on EBAY. I have dealt with some VERY wonderful people while buying these parts. And, some NOT so wonderful folks. But for the most part, it was a good experience. 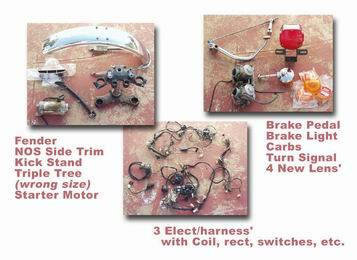 I have acquired enough parts to now put this bike back together. It is going to be a very involved project. I have yet to successfully start the engine, although the electrical system seems to be functioning properly. 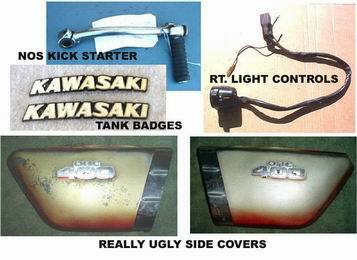 The REAL task will be to make the bike cosmetically acceptable. Everything needs to be painted, and a lot of chrome parts need help. I sure wish that I could just hop on it, turn the key, and go! Well, we'll see what happens. As Odd Ivar pointed out on this website, the KZ400 will be 30 years old in 2004... This picture shows two motorcycles. The one on the left, was the 1974 KZ400 I owned 30 years ago. On the right, is a completely original 1974 KZ400 that I just bought. the vibrations were exactly as I remembered. It was as if I had ridden that old bike just yesterday. My original idea of getting a KZ400 again was only that, JUST an idea. 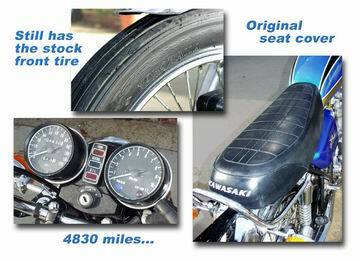 But that all changed after I found Odd Ivar's KZ400 website. Seeing his beautiful red bike and all the wonderful data and "links", made me REALLY want to have another one. 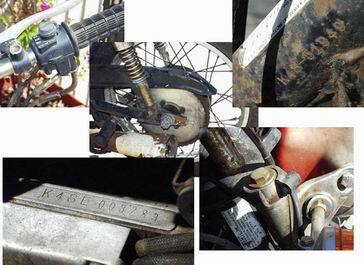 following pictures show more details about this bike. I found this bike by luck. 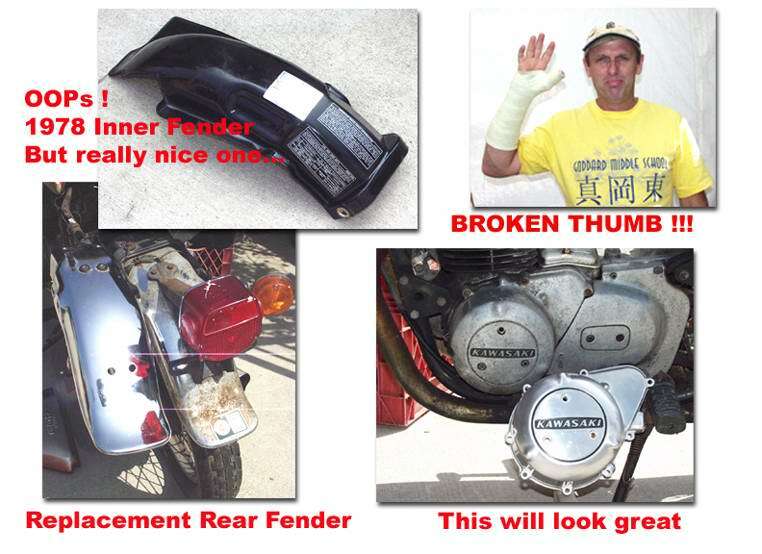 I bought an engine side cover on Ebay for the red 1975 bike. The seller of the part had this blue 1974 bike for sale. After seeing photos and reviewing basic info of it, I knew that I had to have it. I needed help from a friend. So at 4:30 AM, we drove his pickup truck up to Las Vegas. He had to stop and play a little Blackjack, but we met the seller that morning and made it back home by 2:30 PM. there little to no rust anywhere. Maybe having been in the dry climate of Las Vegas helped out. 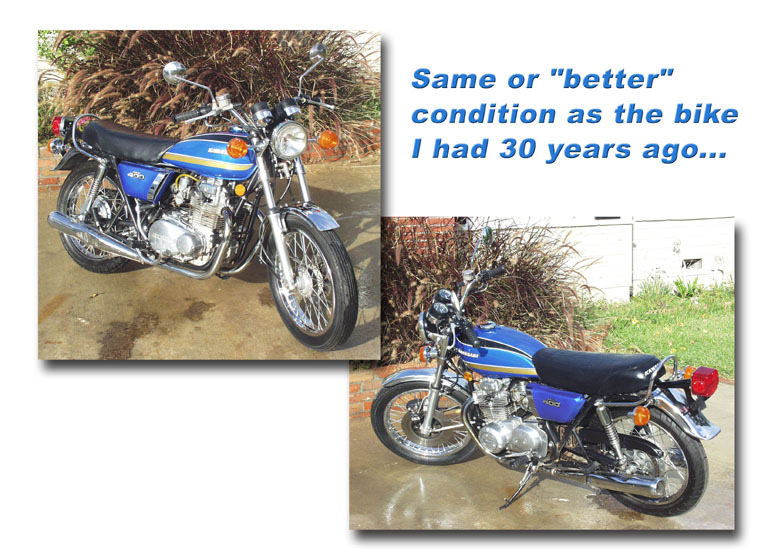 It is not in perfect condition, but it is at least in as good a condition as the bike I had 30 years ago. electrical system however appears to be in great shape. Here is the worst of it. Both pipes have some dents and scratches. The "stator" cover has deep gouges on the bottom side. 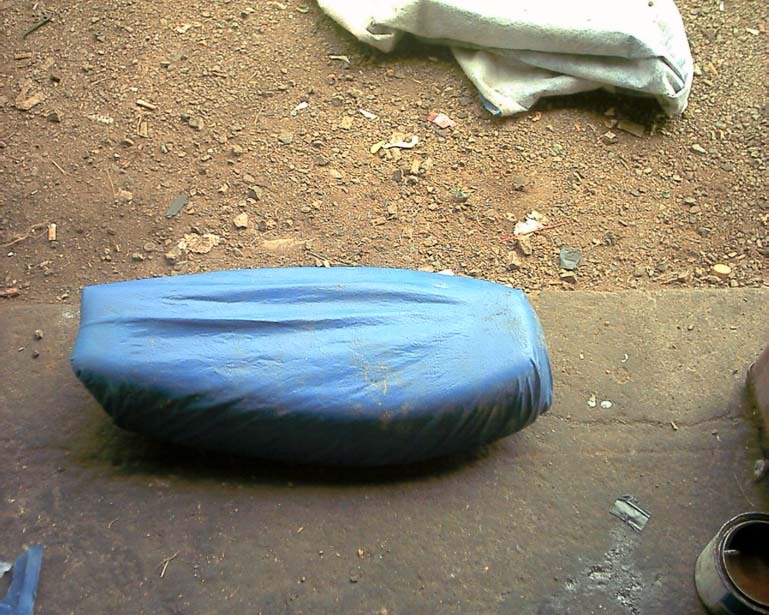 However, I have an NOS cover ready to install. I also have a replacement engine and points cover as well. "re-do" or "replace" some of the items. It's a 30 year old machine that looks damn good for it's age. I don'twant to cover up anything. I will try to clean up some of the cosmetic items, but will leave most of it as-is. My name is Travis and I am restoring an old 1976 KZ400D motorcycle my brother gave me. It has been sitting in my garage for 6 years. The throttle cables were stuck and the carbs were gummed up really bad. The gas tank was also rusted very bad. I didn't think it would be salvageable but thanks to Kreem tank liner it going to be ok. Im needing a few parts here and there like carb kits and valve adjuster plugs for one side, one side had the replacement 17mm but the other side had the old 13mm and one of them broke off on me. Oh well just another task, but not as bad as the carbs. 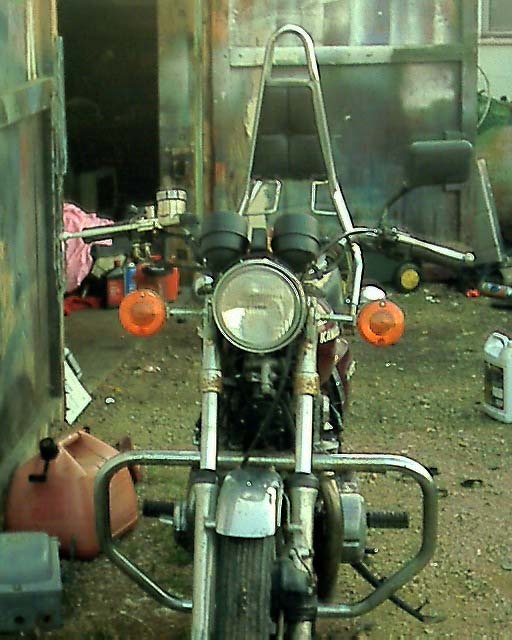 They were stuck together and had 1/8 inch varnish in the bowls.I had it running, not good, but it ran so I decided I needed carb kits.Other than those things I need a seat or to redo the cover on mine and a clutch cable and I'm ready to ride again. Eventually I am going to overhaul the engine. It is burning a little oil, but has good compression, so I believe my problem is the valve seals.But I'm having a great time putting my extra time into this old bike. I have loved it from the day my brother bought it and when he quit riding it I started and have always enjoyed the freedom it gave me.I will keep in touch with you through out my experience and will send you updated pics of my progress. 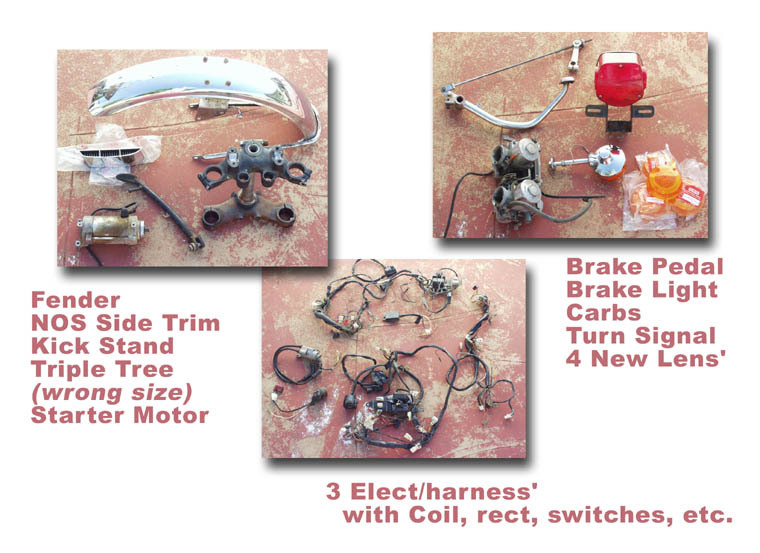 I purchased a clutch cable today and went looking for carb parts. Nobody has the kits I want. they can order the jets but they will cost as much as the whole kit Z1 has for a 74-75 model. The main jet in the kit is bigger than mine but I could really use the gaskets and needle jet, the most rest of mine looks ok. My gas tank turned out great. It's dry now, just done it yesterday. Oh and one question; what is the best thing to soak my carbs in?? I don't want to use something too harsh I would like to have carbs and not junk aluminum. Well I succeeded in repairing the carbs with just the main jet O-rings that I happened to find at Jim's motorcycle sales in Johnson city Tn. They also had the valve adjusting plug I broke off. I had a bit of bad luck, got it back together and rode it around the yard and the throttle cable broke, so off to the parts store.Luckily I found both the cables (the clutch and throttle) at C.A.P.S. CYCLE here in Bristol, TN. Boy what luck. Now I'm going to get my sister-in-law to recover the seat, and I've go to do something about those ugly pipes. I rode it out on the road for first time today. First couple miles went good then it started cutting out and died right there on the side of the road. 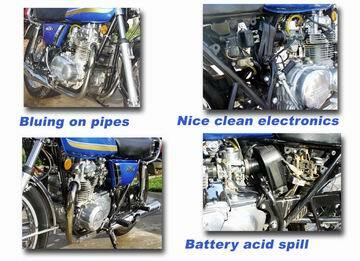 It didn't take long to figure out the carbs were empty cause the fuel filters were dry! !Well what now?? I thought floats not right? ?Tank not venting?? I finally made it back to the garage and shew thank goodness it was just the tank vent was clogged up with a little bit of the kreem tank liner. Well I was off again. This time, since I had already went by where it had died on me, I decided to hit the highway oh man what a feeling of success when I took off and accelerated to speed. No cut out, just smooth acceleration and running. I rode 28 miles. All right, I though, almost ready. I returned home (to the garage, it's beside my house) let it cool down, and started cleaning it up. Man what a nasty mess. But I can say it is well worth it.I've included some pics of my progress just a little bit more and it'll be done. I'll keep you updated .. I haven't done much to it lately, just ordered new sprockets and chain. They will be here Tuesday. August 12th my wife and I are going to ride it to shady valley tn. to the "rally in the valley. Ii've put 1200 miles on it since I started and have one oil leak. The cam cover o-ring is leaking a little bit, but every thing else is fine.I have decided to order a seat cover. My sis-in-law hasn't got too much spare time, so I still have my make do one on it.